Orright, WATS goin’ on here then? 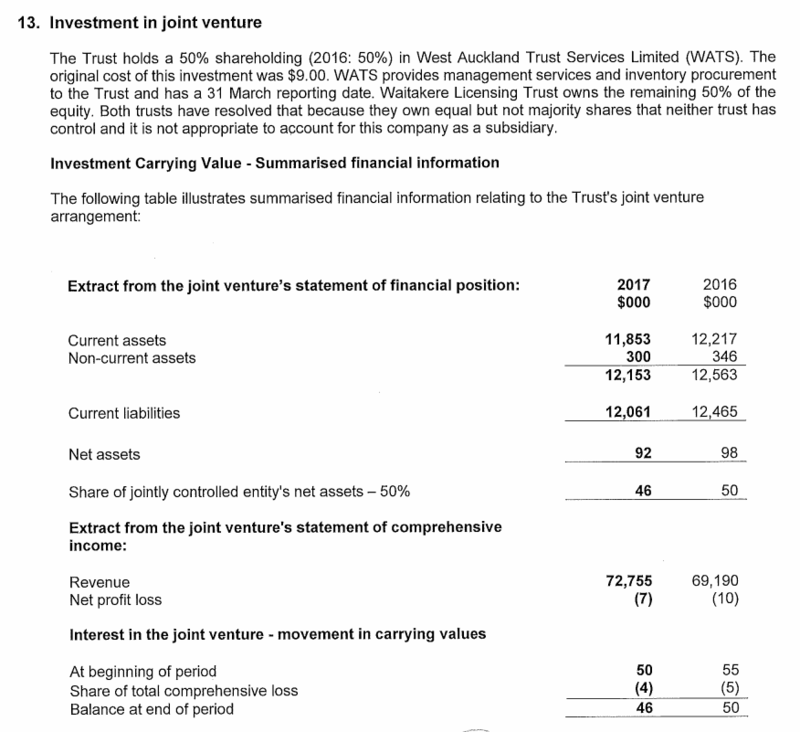 The Trusts operations are centred around a joint venture company called West Auckland Trusts Services Ltd (WATS Ltd). It enables the two licensing trusts to operate as a single commercial enterprise and delivers efficiencies. But it also hides information about The Trusts from the public. In this post, we’ll try and explain how it works and what it means for West Aucklanders. 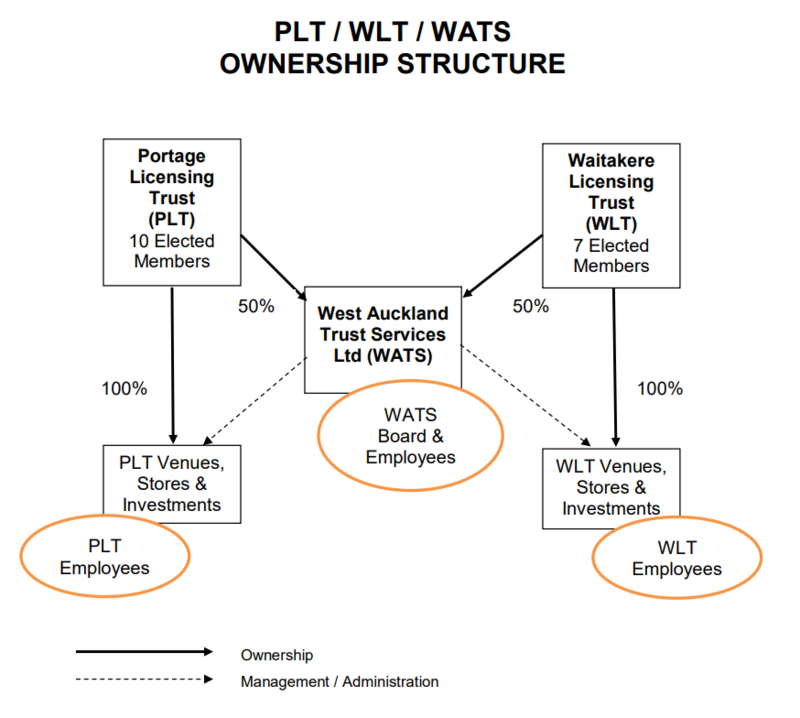 The Portage and Waitakere Licensing Trusts operated as separate units until the late 1990’s, whereupon PricewaterhouseCoopers recommended they establish a joint management entity to achieve economies of scale. WATS Ltd was thus established and The Trusts brand was born. Today, The Trusts consists of three active legal entities. NB – WATS Ltd also has one subsidiary company (Local Liquor Ltd) but it is not currently trading. We asked The Trusts if this company were dormant (which generally means no significant transactions in the last reporting period) and they responded with ‘not trading’ – so we’re waiting for confirmation but expect it to be dormant. WATS Ltd provides management and procurement services to the licensing trusts. The licensing trusts retain ownership of their stores / venues / investments and WATS looks after them on their behalf. WATS Ltd also provides administrative/secretarial services to the licensing trusts. The Trusts have provided us with the original deed which sets out the relationship between WATS Ltd and the two licensing trusts. Overall, this appears to be a fairly sensible structure. Avoiding duplication between the two licensing trusts undoubtedly delivers efficiencies. Also, the licensing trusts have recognised their lack of expertise in overseeing a commercial retail / hospitality business and brought relevant commercial knowledge to the table through the WATS Ltd board. There are other, potentially less desirable, consequences though – particularly in relation to transparency and accountability. Licensing trusts are subject to the Local Government Official Information and Meetings Act (LGOIMA). LGOIMA means that information requests from the public must be answered unless there is a good reason to withhold the information. Although WATS Ltd activities are solely focused on the licensing trusts’ operations, as a limited liability company, it is not directly in scope of LGOIMA. However, information that WATS Ltd is deemed to hold in their capacity as a contractor to the licensing trusts is in scope of LGOIMA. We don’t know exactly what that will mean in practice but we currently have a complaint sitting with the Ombudsman [details here] and they will determine what (if anything) WATS will be required to disclose. In addition to LGOIMA, licensing trusts have a legislated obligation to disclose remuneration details “for employees or former employees who were paid remuneration and other benefits of $100,000 per annum or more as employees, the number of those employees broken down into bands of $10,000”. WATS Ltd is not bound by this disclosure requirement. No disclosure of remuneration has been made by the licensing trusts, therefore we can assume that any staff receiving more than $100K are WATS Ltd employees. As a joint venture, WATS financials are included in the published licensing trust statements only as a single line in the income statement (“share of profit/loss in jointly controlled entity”) and the statement of position (“investment in joint venture”). This is called the equity method and is now accepted practice for joint ventures (i.e. they’re not being dodgy, this is how it is done). WLT and PLT include summary financials for WATS in their financial statements and also a summary of transactions with WATS (related party transactions). Whilst this disclosure is better than nothing, they provide us with only minimal information (excerpt below). What we can see of the WATS Ltd financials raises quite a few questions. I have sought some answers for these in an information request currently being processed by The Trusts. In an upcoming post, I will outline the concerns and questions I have raised. One final thought. There is nothing stopping The Trusts from disclosing more information other than their own policies. The JV structure is undoubtedly more efficient – but it also hides much of what is happening at The Trusts. This downside could be overcome instantly with a simple decision from our elected members… to treat WATS Ltd as if it were a licensing trust and disclose accordingly. Who are WATS Ltd directors? The independent directors are paid for the services they provide. The Trusts have so far refused to provide any details of these payments. Elected members serving on the WATS board are also paid to attend meetings (held approximately monthly). The Trusts have so far refused to provide any details of these payments. The WATS Ltd constitution provides some information on the director appointment process. Haven’t signed the petition yet? 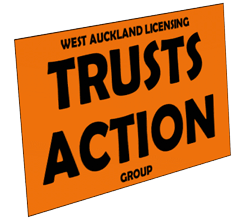 Click here to sign the petition now and help us remove The Trusts’ monopoly on West Auckland.